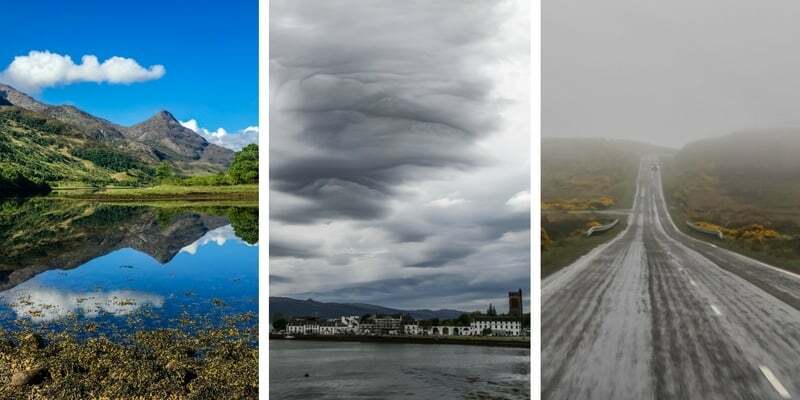 Time to plan your Scotland Road Trip ? Great! 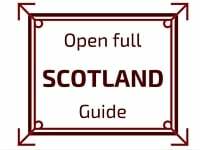 You must be excited 🙂 To help you prepare your travel around Scotland, here is a guide with information about seasons, itinerary, transportation, accommodation, driving... All you need for a successful Road trip in Scotland! That is a frequent question as the situation is quite confusing. In sports you consider Scotland as a separate country. But on the international political scene, the United Kingdom is represented. But it does print its own pounds with different bill size and images... Confusing!!! With such amazing landscapes, all periods of the year have something to offer and could be the best time to visit Scotland. It really depends on what you love. There are midges from April to October, especially near water. Personally I had none in May but it varies greatly from year to year. Many consider the the Best time to visit the Scottish Highlands are in Autumns as the colors enhance the bare landscapes and mountains. 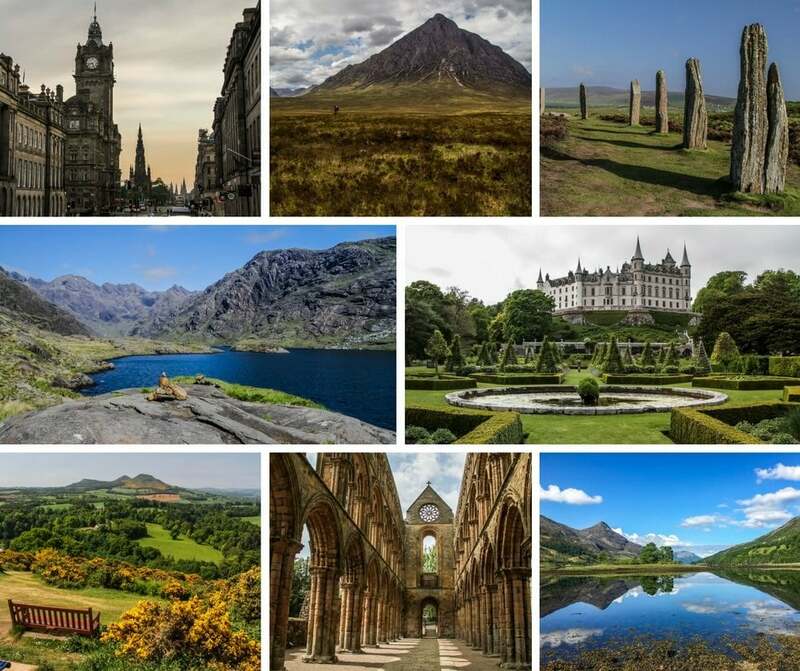 With so much history and nature to offer, your Scotland Road Trip will be quite busy. To help you plan you Road Trip itinerary around Scotland, you can use this site and have a look at the eBook I wrote to make your planning a lot easier! 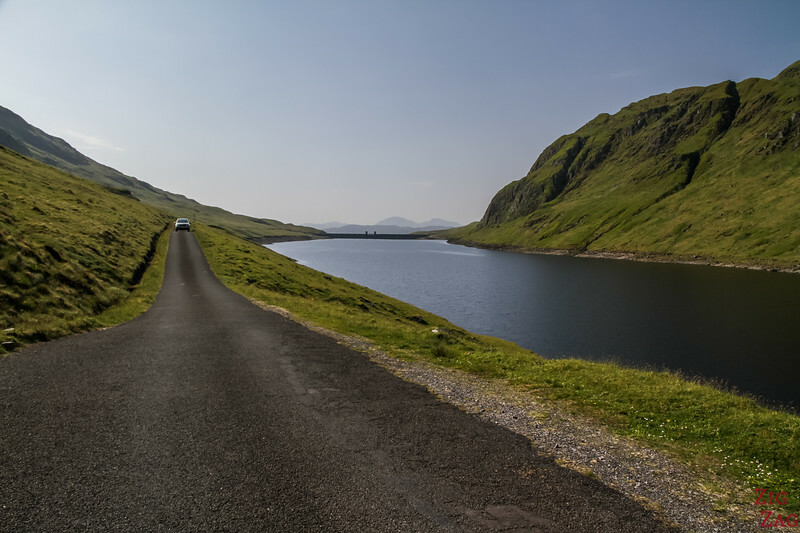 Driving in Scotland is generally quite easy and stress-free even if it is on the left side of the road 😉 With so many amazing landscapes to admire alongside the main and side roads, Renting a car in Scotland is definitively the best option for freedom. 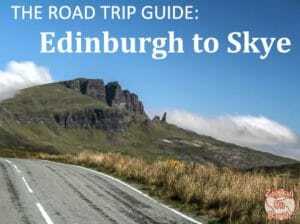 Check out the video, information and advice on my article dedicated to driving in Scotland. If you want to save on accommodation, you can also travel by campervan or motorhome. This is great to wake up in beautiful locations. Just keep in mind that in Scotland has many roads which are single track. Crossing cars might be difficult in some places and difficulty is not indicated on the roadsigns. Of course it has a typical disadvantage of not allowing you to stop and admire the landscapes along the track or road. And it will not take you along side roads such as the magnifient Glen Etive. There are small airports on most islands and smaller towns, which could help traveling within Scotland. But if you wan to just sit back and relax, they are a huge quantities of organized day trips and muti-day tours around Scotland. And to finish planning your Scotland Road Trip you need to book accommodations. Scotland has a good selection of Hotels, Gueshouses, BnBs and Rentals. BnBs are the most typical mode of accommodation in Scotland. They are great to enjoy typical Scottish Breakfast and meet locals. Check out my article dedicated to Scotland Accommodations with suggestions and reviews of places where I stayed. ​The language in Scotland is English with a strong accent and some specific expressions. Be assured you will have some interesting moments taking with locals!!! The money used in Scotland is the British Pound. However to do be surprised that the bills may be different as Scotland prints its own money. Both Scottish and United Kingdom bills can be used in when traveling in Scotland. Credit card is largely accepted but some small BnB sometimes accept cash only so always have enough with you to pay the next night. There are no fixed rules for tipping in Scotland. It is not common to tip in pubs unless the service is excellent. They often have a jar for tipping. The 10% rule tends to apply for taxis. Do not forget hat and gloves as the wind can be very cold even in Summer. Otherwise nothing special... Use my Travel Packing Checklists to get ready for your trip. And don't forget to bring binoculars to make the most of those views!!!! Check out my guide to find the best travel binoculars for your needs. Ready to start your Scotland Road Trip? Hello Claire, I am so happy to have found your many posts about Scotland. I actually purchased the Scotland Road Tip Guide Ebook last week and find it very useful. One of the reason for us to visit Scotland is to go back to our roots which, in my case are traced back to Perth. We plan to road trip from Sept 3 to Sept 18. Starting from Edinburg, we would take your recommandation for the Stirling region before heading to Inverness followed by a quick Orkney tour and then heading down to Skye, Glen Coe, Loch Lomond. Thanks for your comment. I am glad you are finding my blog and ebook useful. St Andrews is on page 130 of the Scotland Road Trip eBook. If you are tracing your roots, a night in Perth would be nice. You could do Stirling Castle in the morning then head to St Andrews in the afternoon and back for the evening in Perth. And do the Queen’s view in the morning before heading North. However if you have done the Edinburgh Castle, It would be redundant to do the Stirling Castle and you could do St Andrews in the morning, followed by a drive around the many lochs West of Perth and spend the night in Perth. Hi there, will the ebook download on a Kindle? No, the eBook is a PDF. The maps and pictures would not work well at all with the Kindle so I have not created a version for it. Thank you very much for your reply. I would just like to know if I purchase it and download it onto my laptop (for planning purposes of our trip), will I be able to then also use the PDF on another device (iPad) whilst physically traveling around Scotland? Sure. You will receive a link allowing you to download it on several devices.